Five Samford University students received cash awards from the Birmingham Center of Colonial Dames of America for outstanding papers written in Samford history classes. The papers were submitted in the Colonial Dames' American Independence essay contest. James Franklin Lowe, a junior history major from Fayetteville, Ga., won first place for his paper, "Albion's Abolition: The Moral and Public Campaigns that Ended Slavery and the Slave trade in Britain and British North America." He received a $1,000 cash prize. Clay Mapp, a junior history major from Greenwood, Miss., won second place and a $750 cash award for his paper, "Vigilantes of the Backcountry: the Regulators of South Carolina." Sarah Grace Buckley, a senior history and journalism and mass communication double major from Florence, Ala., won third place and $700 for her paper, "The Parsons' Cause and Tactics of the Clergy and Anti-Clerical Groups: 1758-1766." Matthew Sessions, a senior history major from Monticello, Ga., won fourth place and $650 for his paper, "The North Carolina Regulators: Motivated Men." Baker Ellis, a senior history major from Danville, Ky., won fifth place and $250 for his paper, "The Forgotten Drama: the Burning of the Gaspee." 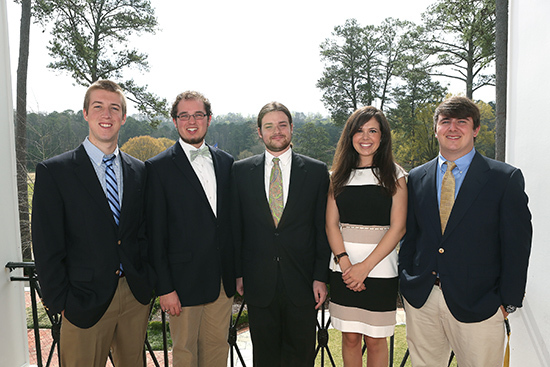 The award winners gave brief overviews of their papers at a luncheon at Mountain Brook Club on April 2. The awards were presented by Samford history department chair Dr. Jonathan Bass. A bound volume containing the papers was dedicated to Birmingham Center awards committee chairman Grace Whatley. It will be housed in the Samford library.